From whitewater rafting and Segway tours to retro arcade fun and exploring the Colorado Wolf and Wildlife Center, the options for families traveling with teens are endless in the Colorado Springs area. 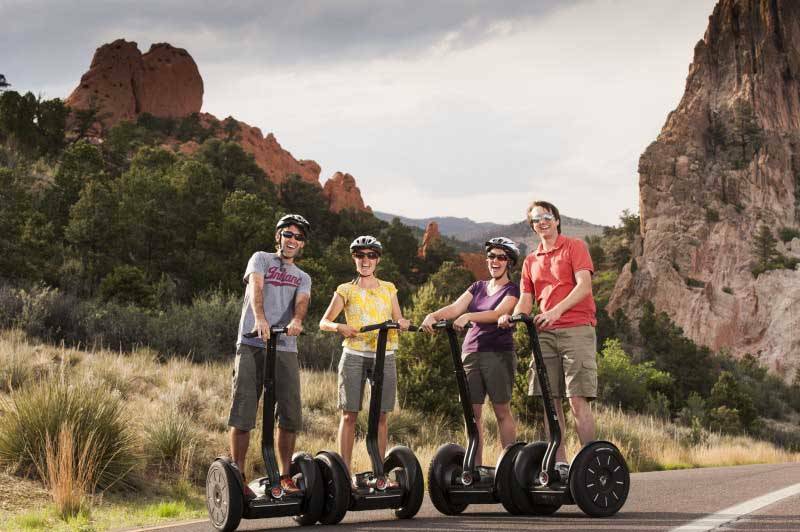 Adventures Out West’s Garden of the Gods Segway Tours provide up to two hours of exhilarating Segway time at one of nature’s greatest wonders, Garden of the Gods. During the tour, a guide leads crews to views of the ancient red-rock formations, along with eagles’ nests, exotic plants and wildlife. Tours start at the Garden of the Gods Visitor & Nature Center, and a 30-minute training session is required for all riders. Battlefield Colorado’s outdoor laser tag park brings to life many combat-style missions from video game favorites such as Call of Duty, Halo, Battlefield and more. Players can choose from an assortment of realistic gaming adventures at locations in downtown and southwest Colorado Springs. Check out the open-play schedules on their website; reservations are required for parties of 10 or more. The Colorado Springs area is known for its stellar indoor and outdoor rock-climbing opportunities. CityROCK is an expansive indoor climbing facility with 225 feet of unique cave passages and classes for kids and adults, including introductions to bouldering and top-rope climbing. Also known for its knowledgeable climbing instructors, Front Range Climbing Co. offers lessons and guide services to popular local climbing areas like Garden of the Gods Park, North Cheyenne Cañon and Red Rock Open Space. Colorado Jeep Tours offers thrilling off-road excursions in the comfort of open-air Jeeps that are customized for smoother riding. Pick one of their bundled sporting packages that pair a Jeep tour with ziplining, a ride on the Royal Gorge Route Railroad and other activities. Meanwhile, Play Dirty ATV offers access to routes in the Texas Creek Trail System — one of Colorado’s most celebrated ATV destinations. Individuals ages 16 and older are allowed to ride their own ATV with a parent or guardian along on the tour, while anyone 15 years old and under can ride in a side-by-side ATV. Either way, dirt will fly and the out-of-this-world off-road views will leave your youngster grinning from ear to ear. Ziplining is something everyone should try at least once in their lifetime, so why not give your teen the chance to try it over the Royal Gorge? Royal Gorge Zip Line Tours has more than 20 zipline courses, ranging from classic to extreme, over the majestic canyon. The extreme course is one of the fastest in North America and features 11 lines spanning over 1.5 miles. For families seeking bonus thrills, they also have packages that include whitewater rafting and Jeep tours. Get up close and personal with majestic creatures, including wolves, coyotes and foxes, on a one-hour tour (advanced reservations required) of the Colorado Wolf and Wildlife Center in Divide, one of the few sanctuaries certified by the Association of Zoos and Aquariums in the U.S. Learn about the mammals’ biology, history and current issues they face, and participate in a once-in-a-lifetime group howl. Let your teen’s inner gamer run free at the crowd-pleasing and wallet-friendly Manitou Springs Penny Arcade, home to an impressive collection of both retro and modern arcade games. Loose change is a must — cost of games range between a penny and $1. Highlights include old-school Pac-Man, Skeeball machines from almost every decade and more than 25 pinball machines. This article was originally published on Colorado Springs Convention & Visitors Bureau’s website.